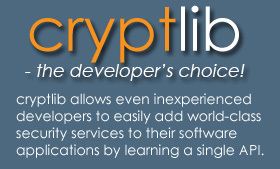 The best way to illustrate what cryptlib can do is with an example. The following code encrypts a message using public-key encryption. This performs the same task as a program like PGP using just 6 function calls (to create a PGP/OpenPGP message, just change the CRYPT_FORMAT_SMIME to CRYPT_FORMAT_PGP). All data management is handled automatically by cryptlib, so there’s no need to worry about encryption modes and algorithms and key lengths and key types and initialisation vectors and other details (although cryptlib provides the ability to specify all this if you feel the need). This is all that’s required — just copy the above code into your application to S/MIME-enable it. If you prefer SSH to SSL, just change the CRYPT_SESSION_SSL to CRYPT_­SESSION_SSH and add a user name and password to log on. As with the encryption code example above, cryptlib provides a single unified interface to its secure session mechanisms, so you don’t have to invest a lot of effort in adding special-case handling for different security protocols and mechanisms. As with the secure enveloping example, cryptlib is performing a large amount of work in the background, but again there’s no need to know about this since it’s all taken care of automatically. This code takes a smart card and generates separate encryption and signing keys in it, requests a signature certificate from the CA for the signing key, uses that to obtain a certificate for the encryption key, obtains any further certificates that may be needed from the CA (for example for S/MIME signing or SSL server operation), and stores everything in the smart card. Compare this to the hundreds or even thousands of lines of code required to do the same thing using other toolkits. Oh yes, and cryptlib provides the CA-side functionality as well — there’s no need to pay an expensive commercial CA for your certificates, since cryptlib can perform the same function.